Symbols*: The beaver is assiduously gnawing on a branch. It is building its home from the raw materials harvested from the marshy terrain. The accumulated wood lies in a tangled heap. 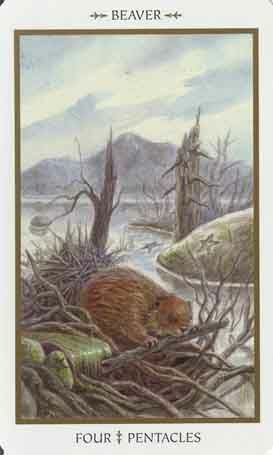 It will take the beaver’s great skill and determination to transform the crude materials into a viable home. As the weather becomes more unfavorable, there is urgency for the beaver to expedite its engineering task. But once the project is completed, the beaver will have the ability to move around in its safe retreat and survive the harsh conditions that may potentially batter the exterior of its home. Description*: Financial security can serve as a motivating factor in our lives. The quest to acquire material comforts is an extension of our survival instincts and often reflects our need to maintain a certain amount of control over our destinies. But sometimes the quest for materialism can inflate into an unhealthy attitude about money and social position, resulting in an insatiable thirst for possessions. This can affect our decision-making sensibilities and distract us from what truly matters. Possible Meaning: This card is a gentle reminder of making your dreams come true, material or spiritual, big or small. Even if you live in a place where you don’t enjoy being, remind yourself the beautiful aspects of it. Thoughts/Points to Ponder: This image seems to be cold at first, a little lonely. As I examine it more, I see the beaver working. She’s working to get her ideal home, one that is cozy and warm. I see her making the best out of the situation she can. This is what she reminds us to do as well – to make what seems impossible, possible. She is definitely a home maker. If she was human, she would also be cooking and baking, wanting anyone who passes her by to stop by and enjoy her food.